There was a summer not too long ago that I worked at a mexican restaurant. We would basically dance around and pour a few margaritas and it seemed like the money followed. In fact, it was pretty often that the owner would pull us out from behind the bar to dance with us while we still had customers waiting to be served. I have never seen drama anywhere like I saw at this restaurant. There was a constant he said/she said battle between any given servers, someone walking out mid shift every week and employees that only showed up when they felt like it. Along with that, our shift meal was dependent on the mood the chef was in. I decided to take matters into my own hands. It seemed that the more I flirted with the chef, the more food he would make for everyone on staff. I like to call it taking one for the team. Anyway- that’s where I first had enchiladas! We didn’t eat a ton of Mexican food growing up, and if we did it was always the simpler nachos or tacos. These enchiladas will please every gluten free/vegan friend you have in your life. It seems like a lot of steps but trust me, it’s worth it. Homemade roasted tomatillo salsa is what makes these so special. And tomatillos are just about the cheapest thing you’ll find in the produce section- you can usually find them for about a dollar a pound (which is a LOT of tomatillos). This salsa verde is great right here as it is. I love it on chips, tacos, anything really. But we’re here for enchiladas! So let’s turn this salsa into enchilada sauce. In a small saucepan, combine the cornstarch with 1/4 c of the stock and whisk over medium heat until there are no more lumps. add the rest of the stock and the salsa verde and heat through. Roast the acorn squash! You can do this at the same time as you roast the stuff for the salsa. Cut the acorn squash in half lengthwise, scoop out the seeds and drizzle with a bit of olive oil. Bake at 450 for about an hour until the insides are soft. 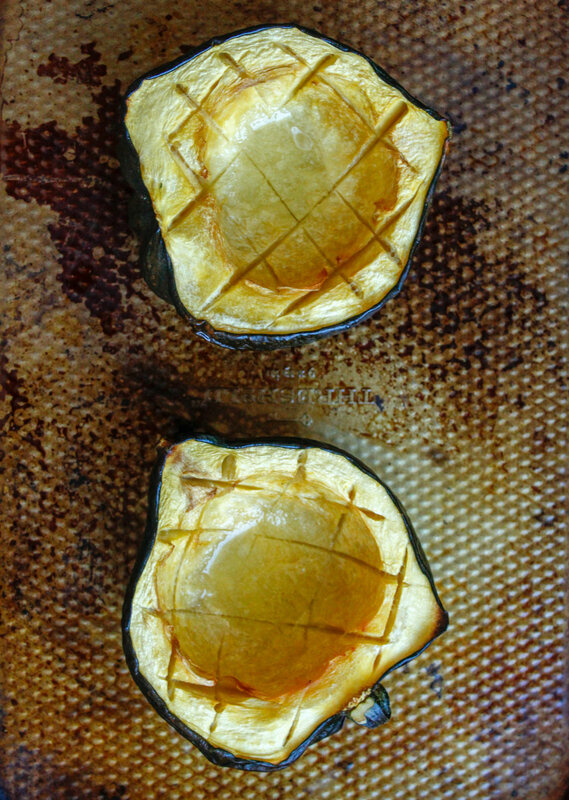 Make the filling: Scoop the roasted acorn squash into a large bowl and discard the skin. Combine the rest of the ingredients (minus the corn tortillas) in the same bowl with a fork until mixed throughly. Heat the tortillas: I did 7 at a time in the microwave for 30 seconds under a damp paper towel. This prevents them from ripping when you go to roll them! In a 9x13” or two 8” pans, spread enough of the enchilada sauce to cover the bottom of the pan. Scoop 1/2 c of the filling into the center of a tortilla and wrap it up, placing the seam side down in the bottom of the pan. Repeat until all the enchiladas are rolled, then top with the remaining enchilada sauce and bake at 375 for 30 minutes until the sauce is bubbling and the edges of the enchiladas are just starting to brown up. Remove from oven and top with pico de gallo to serve!! If you have non-vegans, of course you can top the enchiladas with cheese before baking and sour cream after baking! These can be prepared up to 24 hours in advance and covered once assembled, just bake them off when you’re ready to eat!